It kicks off in just 2 days time and is set to be the show of the summer here in the UK. London Film and Comic Con will run from Friday 27th to Sunday 29th July at Olympia and will introduce for the first time the LFCC 2018 Star Wars Fandom Zone, brought to you by Fantha Tracks. There’s plenty going on in the Zone – guest signings, dealers, licensees, games, photo ops and more – and one of the things that kids of any age can do is win a DK LEGO Star Wars sticker sheet. 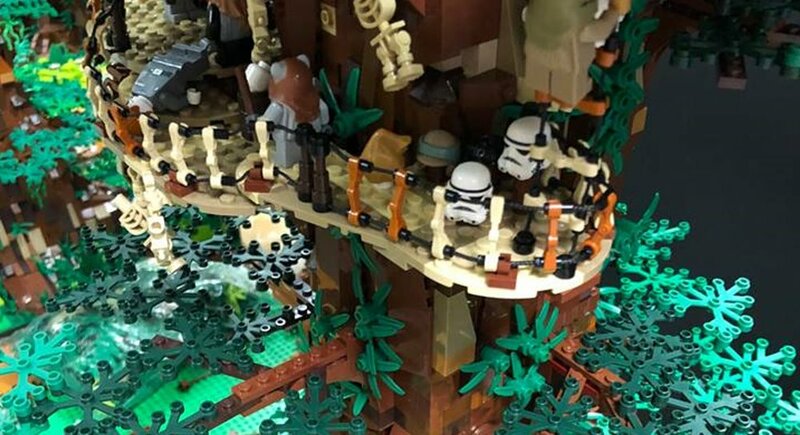 All you have to do is check in at the Fantha Tracks table, say hi to a member of the team (we’re in gold or silver shirts), grab one of our flyers and then head across to the amazing Endor LEGO display and take a very close look. In there is a LEGO mini figure that shouldn’t be in there – you’ll know it when you see it. Head back to the Fantha Tracks table, tell us what the character looks like and where it is in the display and if you’re correct you’ll win the sticker sheet – simples! Many thanks to DK for teaming up with us on this fun competition and stay tuned as we also have a book given to us by DK to give away over the weekend.